You are here: Home / Entertainment / Giveaways / What up, Doc? I promised you a peek into my crazy life, and the exciting things going on in our house right now. I honestly feel like I had more news, but right now this is all I can think of. Hmmm….Maybe the stresses are once again overshadowing the good things. * On Friday, I posted my 500th post here (that doesn’t count all of the posts on my other blogs) and I decided to celebrate with a week full of giveaways. On Mondays, I typically post some new recipes, so I decided to start out with a FOOD giveaway! Click here to see my Country Bob’s Sauce review (There will be 2 winners!) More exciting giveaways each day this week, so be sure to check back! ~Kielbasa and Potatoes…..Here’s another family favorite that doesn’t need a traditional recipe…..Cut about 4 potatoes into bite sized pieces and boil them until they are just undercooked (you don’t want them to be mushy). While the potatoes are cooking, slice one pound of kielbasa/smoked sausage (any flavor or variety). Heat in a large skillet (no oil necessary–there’s plenty inside). I like to add some garlic and Italian seasoning to the sausage. When the potatoes are just about ready, strain them and add them to the skillet with the sausage. Heat until the potatoes are ready to eat (make sure you turn off the heat before you’ve got kielbasa and mashed potatoes!). Perfect with green beans. Yum! Ready in 15 minutes. * I already told you about the exciting news that we are on iTunes now. We are still asking everybody and their dogs to download the free app so that our stats will go up….so that when we release the paid apps starting this week, we will be up there on the page with more exposure. What you can do: Go to iTunes on your computer. Click on the store and type in “peanutbuttersticks”–you will see the icon on the left. Thanks! * Have you seen me on the news (video on the left side of the page)? I only wish that they had used one of my more intelligent, meaningful quotes in the clip….but at least I got my 2 minutes of fame! And, for all those who are wondering….No, I didn’t get anything out of it. They made it sound like they were going to help us get tickets. Nope. We’re not going to the White House Eater Egg Roll. * About a week ago, I won the biggest giveaway ever! I won a Cherish Bound business!! (see my post about Cherish Bound, because I still have a giveaway going on!) I am the newest Cherish Bound consultant, and will soon be YOUR resource for photobooks. I wholeheartedly believe in this product–photobooks that tell your stories. I couldn’t think of a better business to work with, and a better mentor, either. Tara has been wonderful, and I look forward to learning from her. As I learn my way around, I will post more. * This weekend, I was honored with my SEVENTH I Heart Faces winning badge. My natural light photo last week came in 6th place, making my 5th honorable mention (two of my photos made #1). This is absolutely crazy, unbelievable to me! I really don’t consider myself THAT good of a photographer. It’s been a crazy ride, let me tell you! I am NOT letting it go to my head, I promise. I still have SO far to go! 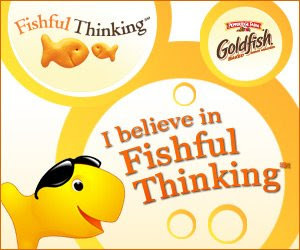 * I’ve already mentioned Fishful Thinking a few times as well….but it has been such a FUN program that I figured I’d make another quick shout out about it. A few of you have asked what is involved in being an Ambassador. Basically, it’s our job to drive people to the Fishful Thinking website and point them towards the articles and activities. Each click is a point…and yes, there are prizes. Last week, I was in 2nd place. I am so excited about that! So…every time you see the fish, click it! :) And, if this sounds like something you’d like to do, ask me about how to sign up as an ambassador. Yes, my life is completely, totally crazy, and it just keeps getting crazier. The language software business stresses have escalated once again, but I continue to have faith that we will not completely fail. We have seen God’s hand in this process time and time again, and we’re hoping for a few more miracles to boost us to where we need to be. In general, I think I’m dealing with it well, I’m happy and mostly calm. Our family life is happy. But this last week, I have seen the physical signs of the stress that I’ve been under. My body is reacting. I’ve been having frequent, daily episodes of my heart problem (SVT, the same thing that 5 month old Stellan is suffering with right now). If nothing else, it has made me feel closer to him, as I think of him each time my heart races or hurts or skips a few beats. I will be FINE. This is just my body’s way of telling me to slow down and not stress so much. But my heart really goes out to Stellan, who is having such a hard time right now. Have a great week, everyone! Thanks for all of your support!